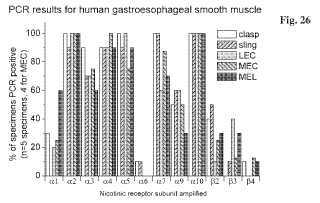 Methods for identifying modulators of gastroesophageal smooth muscle relaxation include isolating various types of smooth muscle fibers from the stomach or esophagus and inducing the fibers to contract. The isolated and contracted fibers are used to screen test compounds for the compound's capacity to modulate relaxation of the smooth muscle fibers. In addition, newly identified unique nicotinic acetylcholine receptors are expressed in a cell, and used to screen test compounds for the compound's capacity to modulate the biological activity of the receptors.